Dr Kieran Hand is a BSc Pharmacy graduate of Strathclyde University and began his career in hospital pharmacy as a resident pharmacist at the Chelsea and Westminster Hospital in London. He earned his PhD in pharmacology from the University of London and continued his research as a postdoctoral fellow before a brief career in the pharmaceutical industry in clinical trials pharmacovigilance. In 2002, Dr Hand returned to Chelsea and Westminster, appointed to a position of specialist microbiology pharmacist, and graduated from the first cohort of the MSc in Infection Management for Pharmacists at Imperial College. In January 2007, Kieran was appointed to the first consultant microbiology/Infectious Diseases pharmacist post in the UK, at Southampton University Hospitals NHS Trust. 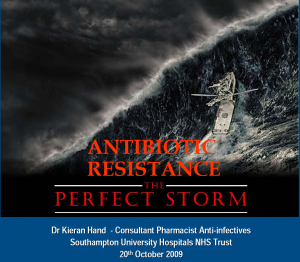 Kieran led a team in SUHT that won the 2009 UK Clinical Pharmacy Associations (UKCPA) Novatis Award for Antimicrobial Management for the design and implementation of an electronic referral system for microbiology ward rounds. He is a committee member former chair of the UKCPA’s infectious management group and he sits on the Health Protection Agency programme board for healthcare-associated infection and antimicrobial resistance and the antibiotics prescribing sub-committee of the Department of Health Advisory committee on Antimicrobial Resistance and Healthcare Associated Infection (ARHAI). Dr Hand is a council member of the British Society for Antimicrobial Chemotherapy and an editor at the Journal of Antimicrobial Chemotherapy. So here we have an eminent speaker and a pioneer pharmacist. 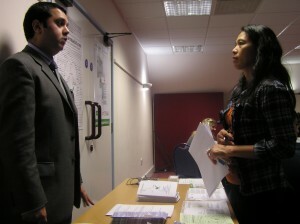 The Royal Pharmaceutical Society of Great Britain (RPSGB) has around 130 local branches which provide a local focus for professional and educational matters and hold regular meetings on a wide range of scientific and current affairs topics. 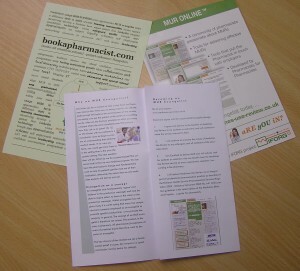 Southampton Branch (http://www.rpsgb.org/branches/Southampton/) is a very dynamic branch consisting of pharmacists from community and hospital practises within the area. This meeting was to my knowledge, one of the best attended with over 60 members setting aside their evening to listen to Dr Hand deliver his talk. I guess we all wanted to know what the storm was all about. A cross section of the audience revealed a diverse audience from final year student of pharmacy at the University of Portsmouth and Pre-registration Pharmacy students to Practising Pharmacists (hospital and community) and Pharmacy Technicians. The first thing that was remarkable about the presentation was its sheer comprehensiveness. There was something in it for the Final year Pharmacy students, something in it for the pre-registration pharmacist and certainly a lot in it for the hospital and community pharmacists. 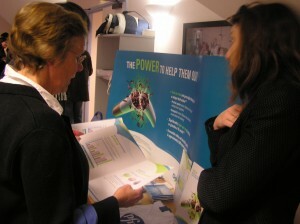 There were practical tips which pharmacy technicians found very interesting. On a personal note, I needed this presentation to help dust down my knowledge of infectious disease and management. So Dr Hand kindly made his presentation available to attendees and we have a copy on our server for registered users of our service to view. Just click here. Otherwise contact Katerina Mesmer (kat@bookapharmacist.com) for a copy of the presentation. The metaphor of antibiotic resistance being a perfect storm is apt. Dr Hand described a declining trend in number of antibacterial agent approval over the last 25 years. From 16 in 1983-1987 to just 4 in 2003-2007. He showed a powerful slide which illustrated the declining number of new antibiotic classes. The Oxazolidinones being the only new class of antibiotics from 2000 onwards. An important element of this gathering storm is the proportional correlation between the amount of antibiotics prescribed and antibiotic resistance. Kieran explained why this might be the case using a powerful illustration. He used the opportunity refresh our minds on mechanism of actions of some antimicrobials and their spectrum of activity. The colourful slides are a God-send and will act as a good quick reference source. Now we know, the question is how do we deal with this gathering storm? Dr Hand’s presentation was explicit. He drew on some of the work he did on Clostridium difficile infections (CDI) at Southampton University Hospital Trust(SUHT). The modifiable risk factors were: (1) Reduce contact with spores and (2) Reduce high-risk antibiotic exposure. The graphs he displayed have started to show a reduction in the cases of CDI at SUHT after the interventions. Another factor that made this presentation unique is the fact that Dr Hand drew on the work done by Professor Paul Little of the University of Southampton in Primary Healthcare. You can hear professor Little on the BBC Today program in July 2008 describing some of his findings (here). Community pharmacists have an important role to play in modifying that cycle of expectation which Professor Little described. The result of the Community-acquired pneumonia epidemiology study by Patrick Charles and others in Australia illustrates the ongoing battle of ideologies over broad-spectrum or narrow-spectrum antibiotic therapy. Matthew Drydon, Kieran Hand and Peter Davey concluded that “narrow-spectrum agents are often as effective and result in less collateral damage” (Antibiotics for community-acquired pneumonia – Journal of Antimicrobial Chemotherapy doi:10.1093/jac/dkp359). So there you have it: We have a gathering storm and we can still do things to mitigate the problem. The overriding messages are: adopt ‘clean’ strategies, delay use of antibiotics in certain primary care situations and use the right medicines for the infection. It is on the back of this that the Hampshire and Isle of Wight developed a Guideline for Antibiotics Prescribing in the Community in 2008. We have a copy for our members to view here. It is now widely used across the area. Many thanks to the Medicines Management Teams, Professor Little and Dr Hand for all their efforts in making this guideline a reality. This meeting was sponsored by unconditional grant from Pfizer and bookapharmacist.com (that is us!). We hope Pfizer will continue to work intently on antimicrobials in order that we may have new agents to help fight the increasingly resistant microbial infections. Many thanks to Pfizer for the support. As far as we are concerned, we will continue to work to support the efforts of the Branch in particular and the changes in Pharmacy, in general. Today we support a Branch meeting. Tomorrow who knows?